Moroccan Pottery is an old, traditional art that uses different type of techniques in different parts of the country. The major influence on the clay items have Berber and Arabic-Hispanic influence. The bright colors, glazes, calligraphic patterns, metallic patch like details are the most characteristic look of these decorative objects. Moroccan pottery is celebrated as some of the finest examples of ceramics work around the world. The cities of Safi, Fez and Meknes produce more than 80% of all the country’s pottery, with Safi being considered as pottery capital of Morocco. Typical local handmade ceramic Moroccan bowls are used as cooking and serving platters. Tajines are adding beauty of elegance to tables by their natural variety of bright colors, design and sizes. Traditional clay ball-shaped glazed vases with head pieces shines under the light as gems: We could not stop buying a pair and carry all the way to Istanbul. 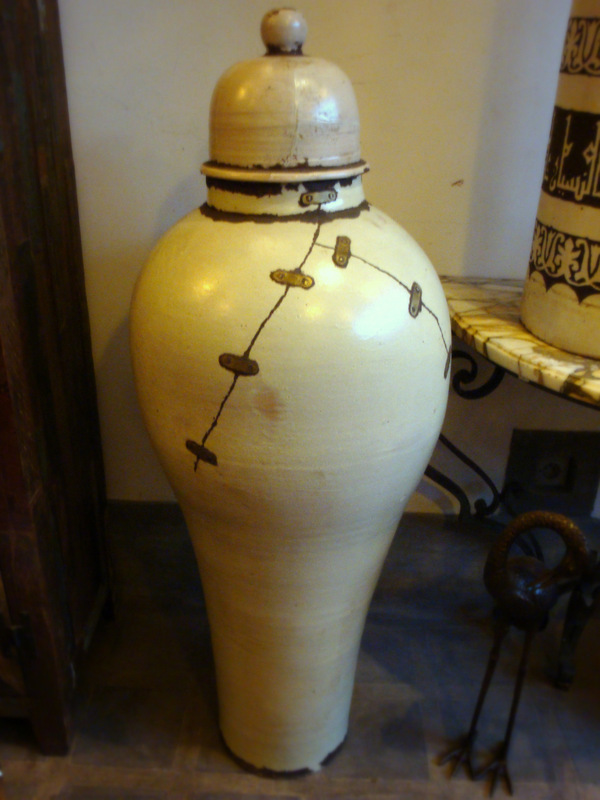 I truly adored the beige color huge vases used in the restaurant of the Riad we stayed in. The large elegant potteries were placed as central pieces and popped out in a modern way in front of the dark painted background around the fireplace. Because of the Jewish community living in Morocco for many years it is possible to see hebrew letters on the ceramic objects as well. Thats another detail which I loved, the way of cultural blending and transforming itself into an art in the aesthetic world of Morocco. The fine combination of handmade geometric, shawl and floral patterns used on clay vase. Next Post Inspired from a snowy winter day!